The much discussed interstellar wanderer called ‘Oumuamua made but a brief pass through our Solar System, and was only discovered on the way out in October of last year. Since then, the question of where the intriguing interloper comes from has been the object of considerable study. This is, after all, the first object known to be from another star observed in our system. Today we learn that a team of astronomers led by Coryn Bailer-Jones (Max Planck Institute for Astronomy) has been able to put Gaia data and other resources to work on the problem. The result: Four candidate stars identified as possible home systems for ‘Oumuamua. None of these identifications is remotely conclusive, as the researchers make clear. The significance of the work is in the process, which will be expanded as still more data become available from the Gaia mission. So in a way this is a preview of a much larger search to come. What we are dealing with is the reconstruction of ‘Oumuamua’s motion before it encountered our Solar System, and here the backtracking become tangled with the object’s trajectory once we actually observed it. Its passage through the system as well as stars it encountered before it reached us all factor into determining its origin. What the Bailer-Jones teams brings to the table is something missing in earlier attempts to solve the riddle of ‘Oumuamua’s home. We learned in June of 2018 that ‘Oumuamua’s orbit was not solely the result of gravitational influences, but that a tiny additional acceleration had been added when the object was close to the Sun. That brought comets into the discussion: Was ‘Oumuamua laden with ice that, sufficiently heated, produced gases that accelerated it? The problem with that idea was that no such outgassing was visible on images of the object, the way it would be with comets imaged close to the Sun. Whatever the source of the exceedingly weak acceleration, though, it had to be factored into any attempt to extrapolate the object’s previous trajectory. Bailer-Jones and team manage to do this, offering a more precise idea of the direction from which the object came. Image: This artist’s impression shows the first interstellar asteroid: `Oumuamua. This unique object was discovered on 19 October 2017 by the Pan-STARRS 1 telescope in Hawai`i. Subsequent observations from ESO’s Very Large Telescope in Chile and other observatories around the world show that it was travelling through space for millions of years before its chance encounter with our star system. `Oumuamua seems to be a dark red object, either elongated, as in this image, or else shaped like a pancake. Credit: ESO/M. Kornmesser. At the heart of this work are the abundant data being gathered by the Gaia mission, whose Data Release 2 (DR2) includes position, on-sky motion and parallax information on 1.3 billion stars. As this MPIA news release explains, we also have radial velocity data — motion directly away from or towards the Sun — of 7 million of these Gaia stars. The researchers then added in Simbad data on an additional 220,000 stars to retrieve further radial velocity information. To say this gets complicated is a serious understatement. 4500 stars turn up as potential homes for ‘Oumuamua, assuming both the object and the stars under consideration all moved along straight lines and at constant speeds. Then the researchers had to take into consideration the gravitational influence of all the matter in the galaxy. The likelihood is that ‘Oumuamua was ejected from a planetary system during the era of planet formation, and that it would have been sent on its journey by gravitational interactions with giant planets in the infant system. Calculating its trajectory, then, could lead us back to ‘Oumuamua’s home star, or at least to a place close to it. Another assumption is that the relative speed of ‘Oumuamua and its parent star is comparatively slow, because objects are not typically ejected from planetary systems at high speed. Given all this, Bailer-Jones and team come down from 4500 candidates to four that they consider the best possibilities. None of these stars is currently known to have planets at all, much less giant planets, but none has been seriously examined for planets to this point. Higher ejection velocities can occur for planetesimals scattered in a binary star system. To demonstrate this, we performed a simple dynamical experiment on a system comprising a 0.1 M⊙ star in a 10 au circular orbit about a 1.0 M⊙ star. (This is just an illustration; a full parameter study is beyond the scope of this work.) Planetesimals were randomly placed between 3 au and 20 au from the primary, enveloping the orbit of the secondary… Once again most (80%) of the ejections occur at velocities lower than 10 km s−1, but a small fraction is ejected at higher velocities in the range of those we observe (and even exceeding 100 km s−1). So keep this in mind in evaluating the candidate stars. One of these is the M-dwarf HIP 3757, which can serve as an example of how much remains to be done before we can claim to know ‘Oumuamua’s origin. Approximately 77 light years from Earth, the star as considered by these methods would have been within 1.96 light years of ‘Oumuamua about 1 million years ago. This is close enough to make the star a candidate given how much play there is in the numbers. But the authors are reluctant to claim HIP 3757 as ‘Oumuamua’s home star because the relative speed between the object and the star is about 25 kilometers per second, making ejection by a giant planet in the home system less likely. More plausible on these grounds is HD 292249, which would have been within a slightly larger distance some 3.8 million years ago. Here we get a relative speed of 10 kilometers per second. Two other stars also fit the bill, one with an encounter 1.1 million years ago, the other at its closest 6.3 million years ago. Both are in the DR2 dataset and have been catalogued by previous surveys, but little is known about them. Now note another point: None of the candidate stars in the paper are known to have giant planets, but higher speed ejections can still be managed in a binary star system, or for that matter in a system undergoing a close pass by another star. None of the candidates is known to be a binary. Thus the very mechanism of ejection remains unknown, and the authors are quick to add that they are working at this point with no more than a small percentage of the stars that could have been ‘Oumuamua’s home system. Given that the 7 million stars in Gaia DR2 with 6D phase space information is just a small fraction of all stars for which we can eventually reconstruct orbits, it is a priori unlikely that our current search would find ‘Oumuamua’s home star system. Yes, and bear in mind too that ‘Oumuamua is expected to pass within 1 parsec of about 20 stars and brown dwarfs every million years. Given all of this, the paper serves as a valuable tightening of our methods in light of the latest data we have about ‘Oumuamua, and points the way toward future work. The third Gaia data release is to occur in 2021, offering a sample of stars with radial velocity data ten times larger than DR2 [see the comments for a correction on this]. No one is claiming that ‘Oumuamua’s home star has been identified, but the process for making this identification is advancing, an effort that will doubtless pay off as we begin to catalog future interstellar objects making their way into our system. 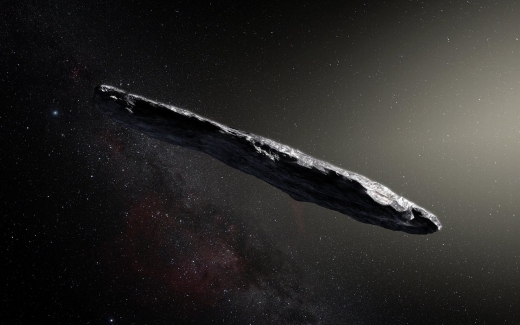 The paper is Bailer-Jones et al., “Plausible home stars of the interstellar object ‘Oumuamua found in Gaia DR2,” accepted for publication in The Astrophysical Journal (preprint). This assumes, of course, that the weak acceleration was likewise present during Oumuamua’s approach toward the Sun, and in a corresponding direction. If Oumuamua is an artificial alien probe, it is certainly in no rush to get to its next target, whatever system that may be. Has anyone calculated to see where the object is headed TO next? Yes: that was done in this paper. Hypothetically, had we managed an OSIRIS-REX/Hyabusa2-type sample return from `Oumuamua, would that offer better constraints on its origin? If so, how much better using what analyses? This is a bubble gum wrapper paper. Meaning fun but useless. Gaias data bring us not 1 iota closer to identifing Oumuamuas home. The singular reason why is that the objects ejection date is completely unknown. Nor even it’s age. The paper simply coordinates a few stellar trajectories with that of the object. Is it really necessary to emphasize that that is not enough?? Obviously not enough. But when is something ever “enough” in science. You can’t dispute that this is useful (and necessary to help find the origin). Intriguing first shot at a daunting task. Since it does not seem that the prediction by certain astronomers that interstellar objects ranging from one to ten will be detected flying through our Sol system *each year* seems to be taking place, should not at least one space agency try to get a probe to Oumuamua before it is way too late? The object deserves a space mission even if there are dozens of interstellar bodies zipping through our star system. It’s too early to say. However, if the 2nd interstellar object fails to show up in our solar system by 2030, then it’s a big yes; someone said crabs. We cannot wait to explore Oumuamua now, let alone 2030. Anyone alert Elon Musk about this? Ioannis, going back through the document, I think you’re right. I believe they’re talking about 10 times the number of stars with radial velocity data, as opposed to 10 times the total number of stars. He professed himself “astonished” by the level of acceleration. Precisely the conclusion Roman Rafikov came to in his paper. ALSO: Bill Gray had a STUNNING quote on the mpml you mentioned: “…The object would have to be made out of aerojel or a big balloon for that to work…” How bout a hollow spacecraft with a mass magnitudes below that of a comet of that projected volume? Yes the object reeks of suspicion and mystery… also where are the brighter interstellar objects which should have been readily visible over the past centuries in order to statistically justify the odds of this visitor following the trajectory it did? Of course the chances of a spacecraft randomly appearing just at the dawn of our great telescope era are also extremely low, so the only logical conclusion must be that, if it was artificial, it was sent by someone presently watching us. One of my problems with this idea of Oumuamua as an alien probe is that it is not very stealthy if its intentions are to explore our star system discreetly – assuming its makers do not want to disrupt the natives’ natural behaviors. Playing along with the idea of this interloper as alien vessel, imagine if they did not know humans exist, did not think we would be smart enough to detect their probe, or did not care if we knew or that we exist. For those who will now clamor the obvious that this is all just speculation without evidence, that is why I say someone needs to get a probe to Oumuamua – yesterday! The mission plan for the BIS star probe Daedalus was to barrel through its target star system simply because it could neither slow down nor stop. The planners also made no provisions for keeping this giant vessel on the hidden side as they assumed no one would be at Barnard’s Star (the original target system) to witness their probe’s visit. Daedalus would also be left to drift into the wider Milky Way galaxy indefinitely with no plans for recovery or visiting another star system. So who knows where it would have ended up and what consequences a giant fusion-powered vessel with an AI brain might have for someone else out there. That this seems to have bothered neither the planners nor anyone else is short-sighted and bothersome. The only way that this can be an interstellar spacecraft is if it is broken(MAJOR thruster issue starting either just before or at periastron)and totally non-functional(just after closest approach to Earth to present)which makes the whole scenario seem EXTREMELY CONTRIVED! ALSO: Everyone please go to the mpml posted by Hamilton1 and click on: “A new study: A new analysis”, posted on September 19, the SAME DAY the Rafikov paper was posted on ArXiv, and presumably in REACTION to that paper. OOPS: I meant “click on “Oumuamus: A new study. new analysis”. THEN: Click on “> show message history” Rafikov’s name IS mentioned here. FINALLY! Rafikov’s paper has now been mentioned on the website of a major astronomy magazine: Sky and Telescope. ALSO: Rafikov now believes that there is one NEAR-INFINITELY REMOTE way for an outgassing tumbling comet to AVOID spin-up, which is; if the outgassing is coming from a perfectly circular region whose exact center was also the EXACT CENTER of the comet. This led me to an intriguing thought: What if a civilization as technically advanced as ours noticed that a comet was going to be ejected from their solar system due to a close encounter with one of their gas giant planets. If they had time, they could send a “Deep Impact” like probe to it and precisely aim an impactor so that it would create such a circular exposed area on the comet, in the hope that it would someday pass through ANOTHER solar system with a technically advanced civilization. I am only bringing this up because if we DO go to `Oumuamua and find that is JUST a comet, could we tell the difference between a natural and a non-natural CAUSE for the outgassing? But in June 2018, a team of astronomers led by Marco Micheli (ESA SSA-NEO Coordination Center, Italy) announced that some force was slightly changing ‘Oumuamua’s trajectory. The researchers argued that the most likely source of this thrust was ice or gas erupting into space that was otherwise invisible. Maybe the dust grains in the surface were too thick, or the composition of the gas made it invisible to telescopes. In any case, they claimed that ‘Oumuamua was a comet after all. But a new study by Roman Rafikov (University of Cambridge, UK), published September 17th on the astronomy preprint arXiv, makes a simple yet compelling argument against the cometary nature of ‘Oumuamua. Rafikov argues that if ‘Oumuamua released enough gas to change its own trajectory, it should also spin increasingly faster, something that the observations didn’t show. Instead observations show a steady, though tumbling, rotation roughly once every eight and a half hours. The only exception, according to Rafikov, would have been if the force propelling ‘Oumuamua was directed very close to its center of mass. “For an object with a very elongated shape and dimensions of hundreds of meters, this sounds close to impossible,” he says. Micheli declined to comment for this article. A simple yet hopefully obvious “message” to any intelligent recipients that yes, the star system Oumuamua came from has (or had) ETI – so check us out! A very circular impact crater has the advantage of lasting for a very long time with no concerns about failed technology. Another reason we should be sending a probe to Oumuamua ASAP. Is anyone who can do something about this listening? And right smack-dab in the MIDDLE of the perfectly circular crater at the center of mass of `Oumuamua could(VERY SPECULATIVE HERE)be a gold-plated disk showing a male alien waving to us and a female alien not waving, both with no apparent attire, an image of `Oumuamua’s home star and its retinue of planets, and a few pulsars thrown in to give us directions. Now, THAT would be a “techno-signature” worth talking about! Given enough time, yes. But if the ejection is recent (past few Myr), these are the best candidates we have. It’s all about probabilities. Your comment implies stars from other galaxies would be equally good candidates. Well, since we are flummoxed by the question of where it came from, perhaps we might gain some insight examining where it is going. Our visit might not be so important as a flyby, but just the thing for alignment to a destination a million years or two ahead. and the odds of contact with bigger objects went down logarithmically as mass increased – and what do you know, in the era of great telescopes, we detect an interstellar object bigger than a football field or an aircraft carrier. And the shape! Since comet are responsible for many meteorite showers, one could hope that this odd piece of work shed something behind it, even if it is an asteroid. If that were the case than maybe there is a debris stream in its wake and an interstellar probe would not be required. E.g., a cube sat could be vectored to an Oumuamua debris field where chunks would follow like ducklings or paper napkins from a tour boat. Just like in Arthur C. Clarke’s 1973 SF novel, Rendezvous with Rama, where the giant alien ship was only passing through our Sol system to fuel up at our yellow dwarf star before moving on to its real target. And yes, we should figure out where Oumuamua is going TO next. If it is aimed directly at another star system, that would be either one heck of a cosmic coincidence, or something mighty intriguing. It would certainly be a clue as to where the space rock is just a drifting rock or something more. This is a bit of a cultural reference; I’m afraid I don’t know what the ‘shape of a pancake’ is – so could you please describe it? I tried googling pictures of pancakes but am getting very imaginatively shaped results. In my culture at least, a pancake is a flat disk-like dough that usually rolled, so is of elongated, cylindrical shape, but I’ve also seen it folded somehow into a circular sector. So is ‘the shape of a pancake’ a disk, a cylinder or a circular sector? Or something else? Guess it can’t be a cylinder since that would just again mean that the object is elongated. For some reason I cannot as yet fathom, Rafikov APPEARS to have ELIMINATED the “pancake” model, so now we are just left with the “cigar” model. ALSO: `Oumuamua is not ENTIRELY red, but instead MOSTLY gray with one red END. In America, pancakes tend to be flat disks. They are generally covered with either butter or maple syrup before consuming, sometimes both. BTW, interesting that you did not know what a pancake was. There goes another one of my cultural assumptions about everyday objects in my society. A good lesson when communicating with ETI. I apologize if I’m being pedestrian about the issue of Oumuamua’s shape. But to say that it might be shaped like a “pancake” is essentially to suggest that it looks like a flying saucer. ‘Oumuamua’s pre-encounter velocity with respect to the solar system was 26.1 km/s, arriving roughly from the direction of Vega. Its outgoing direction will be in the constellation Pegasus at a final velocity of 26.4 km/s. The sky map below shows the direction ‘Oumuamua arrived from on the right (green dot), its original direction prior to encountering the solar system on the left (magenta dot), and its final outbound direction after encountering the solar system in the center (green dot). The space velocity of ‘Oumuamua is similar to the local standard of rest, hinting that it could have been ejected from a relatively young local system. Modeling of the past dynamics of ‘Oumuamua, however, does not suggest a particular neighboring system as its origin, since any identifiable past encounters are at velocities too high to suggest ejection. For example, Portegies Zwart et al. (2017) identify an encounter 1.3 Myr ago at a distance of 0.52 light years from TYC4742-1027-1 (a ~K-type star currently 440 light years from the Sun) but at a relative velocity of 103 km/s. Alternately, Dybczynski and Krolikowska (2017) identify low velocity encounters but at large distances, e.g. one with UCAC4 535-065571 at 5.2 km/s 2.1 million years ago but at a distance of 4.65 light years. They also identify a pass 0.14 light years from HIP 3757 118,000 years ago with a relative velocity of 185 km/s. Note that all of these encounter estimates are dependent on the accuracy of our knowledge of local stellar motions and distances as well as accuracy of ‘Oumuamua’s past trajectory. I think we need to be considering an outside the box possibility and that this is not a probe but rather a communication from an alien civilization. First contact by a more advanced origin would dictate doing so as if walking in egg shells. O seems more likely to be this than a probe, if not a natural occurrence. It’s actually quite a brilliant communication if you think about it, assuming we ask the right questions and learn what was intended.